…inversion of control falls naturally out of writing cohesive units that adhere to the single-responsibility principle (pdf) and the open-closed principle (pdf). Determining whether variant behaviors, which we could also call responsibilities, should be “inverted” or controllable by some callee. I’ll now talk more about each of these considerations. An object may have multiple responsibilities but must only ever have one reason to change. An axis of change is an axis of change only if the changes occur. It is wise not to apply SRP — or any other principle, for that matter — if there is no symptom. If a behavior is truly invariant and never going to change, then the best implementation is likely the quickest as it will cost the business the least. Quick, of course, is not the same as messy. Although we can do our best to make informed decisions about an axis of change, we’re likely going to be wrong much of the time. Software entities should be open for extension but closed for modifications. That means that given a class C, C must be extendable in the way intended without a change to its source code or package (e.g. dll, assembly, jar). When components aren’t packaged in a way that allows an axis of change to adhere to OCP, then the best bet may be to ignore that axis of change until the change actually happens… if it happens at all. Let’s assume, for a moment, that we expect a change in some area. SRP says we should isolate that area of change, or area of responsibility, into a single component. 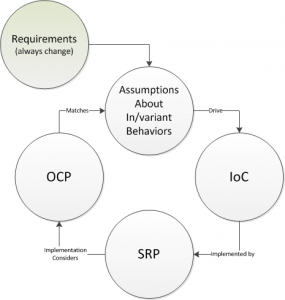 One of the most fundamental ways that we tackle SRP and OCP is through the use of design patterns. The strategy, template method, and visitor patterns all aim to make at least one behavior variant while fixing others. Dependency injection is another way to allow a behavior to vary. Each of these is a form of inversion of control. To summarize briefly, when designing software we must consider areas or axis of change. Some of those should be considered implicitly as we consider testability, ideally using some sort of test-driven development. Then, for those areas where it’s highly anticipated that changes will occur, we use inversion of control so that the appropriate party has responsibility over that area of change. But, that’s really what SRP says in the first place – an object should have only one reason to change, so move that behavior out. And lastly, OCP defines, to some extent, how different components that adhere to the SRP should be packaged. That is, they should be packaged in some way that allows the behavior to be extended (i.e. changed) without the corresponding source code or package needing to change. 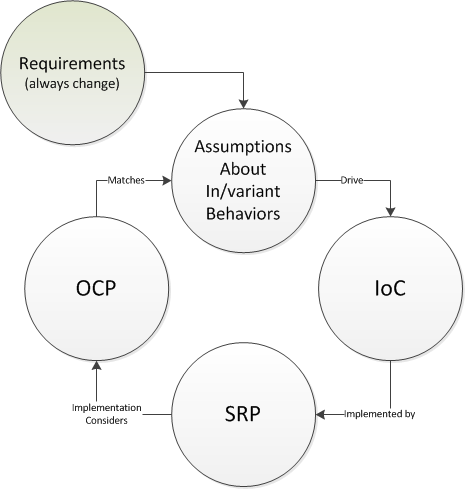 Thus, considering axis of change drives one to invert control, or apply SRP, in a way that can be maintained according to OCP. I’m not even sure it’s even possible to correctly use SRP without using IoC in one form or another — what do you think?